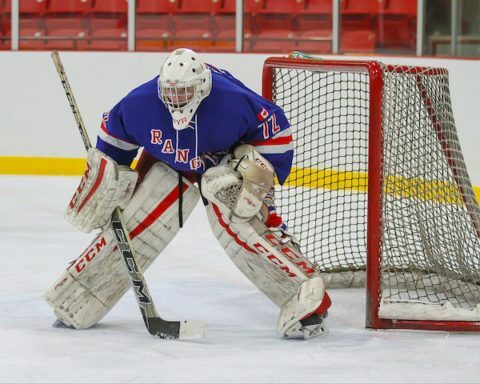 Jett Alexander is the starting goalie for the North York Rangers of the Ontario Junior Hockey League (OJHL), the largest Jr. A league in Canada, governed by the Ontario Hockey Association (OHA) and the Canadian Junior Hockey League (CJHL). 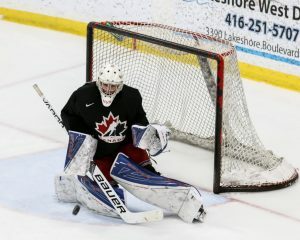 He is considered one of the best goaltenders in the OJHL, and in just his second year with the Rangers, has risen to the forefront of the prospect pool for this year’s NHL Draft. Alexander, a native of Bloomfield, ON, has played hockey in North York since his Midget Minor AAA season in 2014-15. The 18-year old goalie is ahead of his years, already standing at a towering 6’4″ and weighing in at 181 lbs. He was drafted in the 12th round, 225th overall in the 2015 OHL Priority Selection by the Mississauga Steelheads, but has spent all his time in the OJHL. Alexander broke into junior hockey in the 2016-17 season, playing first with the Georgetown Raiders, starting 7 games, posting a remarkable 1.61 GAA and .942 SV%. He then moved to North York, where he would play the rest of the season appearing in 16 games, putting up a 2.84 GAA and .904 SV%. He would appear in 1 playoff game with the Rangers, posting a 3.50 GAA and .864 SV%. For his efforts in his rookie season, Alexander was named an OJHL First Team All-Prospect. Entering this 2017-18 season, the onus was on Alexander to impress and lead the Rangers as a contender for the best record in the OJHL. He has not disappointed, posting a 2.14 GAA and .928 SV%, good for 5th and 3rd-best among all goalies in the OJHL, respectively. He has led North York to 78 points, good for 2nd-best in the league. Also this season, he has earned the honors of playing in the Eastern Canada Cup Challenge in Trenton, Ontario, as well as representing Canada East U19 in the WJAC-19 World Junior A Challenge in Truro, Nova Scotia, in which he played 4 games and had a 3.21 GAA and .892 SV%. I have spent this season working in the OJHL recording statistics, and have had the pleasure of seeing Jett Alexander play in person on a couple of different occasions. Although in the games I watched I saw him chased from his net once and he was not particularly great, I could tell from his fundamentals that he is very strong as far as movement, Hockey IQ, and overall style. For such a young goalie, being 6’4″ has the potential to throw off his game, but instead, he looks like a veteran who has become comfortable with his size and used it to hone his lateral and butterfly skills. Alexander has fast, active hands and looks calm in all situations, using his size in-close to stay levelheaded during net-front scrambles. He uses his head to see through screens and track the puck, and never seems to lose sight of it, not making bad judgment calls on whether or not to drop or push one way or the other. Jett Alexander was added to the NHL’s most recent NHL Central Scouting Watch List, and is eligible for this year’s 2018 NHL Entry Draft. He looks to lead the North York Rangers into the OJHL playoffs on a strong note and compete for a national Jr. A championship title.